Some firms pay well while others don’t; and some are highly productive while many aren’t. This column presents new firm-level data on the increasing dispersion of wages and productivity in both the manufacturing and services sectors in 16 OECD countries. Wage inequalities are growing between firms, even those operating in the same sector – and they are linked to growing differences between high and low productivity firms. Both globalisation and technological progress (notably information and communications technologies) influence these outcomes – as do policies and institutions such as minimum wages, employment protection legislation, unions, and processes of wage-setting. Over the last three decades, several OECD and non-OECD economies have experienced increasing inequality in income between the rich and the poor (Piketty 2014, Piketty et al. 2017, OECD 2016). This has put growth and inclusiveness at the forefront of academic and policy discussions (Furman 2016). 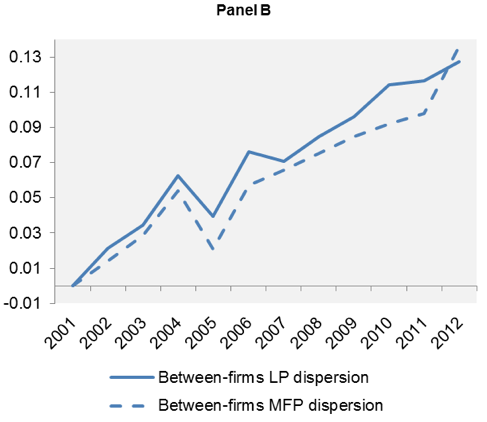 At the same time, recent evidence suggests that there has been a significant increase in the gap between the globally most productive firms and the rest (Andrews et al. 2017). This suggests that there might be a positive relationship between the two divergences in wages and productivity. In a new study (Berlingieri et al. 2017a), we contribute to this literature by providing new evidence on the increasing dispersion in wages and productivity using novel micro-aggregated firm-level data from 16 countries: Australia, Austria, Belgium, Canada, Chile, Denmark, Finland, France, Hungary, Italy, Japan, Luxembourg, the Netherlands, Norway, New Zealand, and Sweden. The dataset contains harmonised information about productivity dispersion and wage inequality between firms. Unlike previous studies: 1) it uses data that is based either on the full population of firms in each country (including small firms) or made representative and comparable by re-weighting, using the full business population; 2) it covers manufacturing and services in 16 countries; and 3) it measures both labour productivity and multi-factor productivity (MFP). The work has been carried out in the context of a wider OECD project called MultiProd, which is aimed at studying productivity patterns across countries using a distributed micro-data approach (for details, see Berlingieri et al. 2017b). The first result of this work is that both wages and productivity have experienced a divergence – that is, an increasing differential between the top and the bottom of their respective distributions. This is true not only across the whole economy, but also within two-digit sectors within countries. In Figure 1, panel A represents the 90-10 log wage ratio, which compares wages in firms at the top 10% of the wage distribution with wages in firms at the bottom 10% of the wage distribution. The upward trend indicates an increase in this wage gap, both across workers in the overall economy (dashed line) and between firms within the same sectors (solid line). Even within the same type of activity, the 90-10 wage ratio is 12.3% higher in 2012 than in 2001. 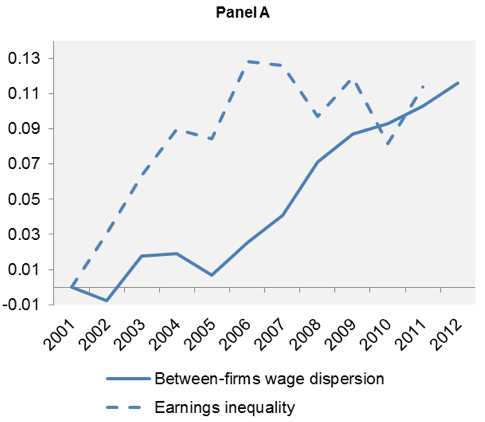 The figure shows that the increase in between-firm wage dispersion is in the same ballpark as the increase in overall earnings inequality. Hence, by analysing wage inequality between firms, we can go a long way in understanding what drives overall wage inequality. This divergence in wages across firms is matched by a divergence in firms’ productivity within country-sector pairs. Panel B of Figure 1 shows the 90-10 log ratio of productivity, capturing the gap between firms in the top 10% and firms in the bottom 10% of the productivity distribution in a given sector. This gap in labour productivity increased by 12.8% between 2001 and 2012 (solid line). Capital intensity typically boosts labour productivity, but the divergence cannot solely be explained by certain firms’ increased use of capital: multi-factor productivity, which accounts for capital use, also diverged, with a 90-10 log ratio rising by 13.6% in the same period (dashed line). We can therefore speak of the ‘Great Divergences’ of both wages and productivity. Note: Panel A (B) plots the estimated year dummies of a regression of log-wage (productivity) dispersion – 90th and 10th percentiles ratio – within country-sector pairs, using data from the following countries: AUS, AUT, BEL, CHL, DNK, FIN, FRA, HUN, ITA, JPN, NLD, NOR, NZL, SWE. The line referring to overall earnings inequality plots the estimated year dummies of a similar regression using the dispersion in earnings from the OECD Earnings Distribution database within each country. The data on overall earnings inequality are only available at the country level and for a more limited set of countries: FIN, FRA, HUN, JPN, NOR, NZL for the whole period; AUS, ITA, SWE from 2002; and NLD between 2002 and 2010. Source: Berlingieri et al. (2017a). Much discussion of inequality has focused on increasing differences between the top 1% of earners and the rest of the income distribution – see, for example, the seminal work on top income inequality by Piketty and Saez (2003). Our study shows that wage inequalities also come from the bottom of the distribution. 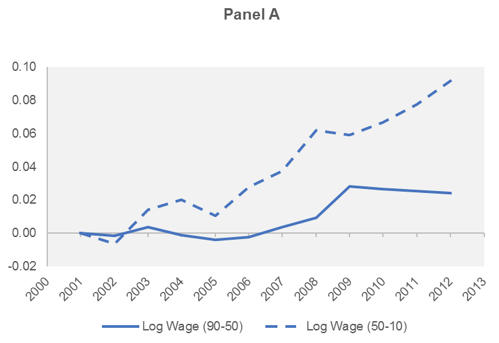 Panel A of Figure 2 displays the log ratio of wages between the top decile and the median (solid line) and between the median and bottom decile (dashed line). The 90-50 log ratio can be thought of as ‘upper tail wage inequality’ – the wage at the 90th percentile (the wage paid by a firm in the top 10% of the wage distribution) relative to the 50th percentile (the firm right in the middle) – and the 50-10 log ratio as ‘lower tail wage inequality’. The gap in average wage between the bottom decile and the median grew faster between 2001 and 2012 than the gap between the median and the top decile – that is, lower tail inequality grew faster than upper tail inequality. The same dispersion from the bottom occurred in the distribution of multi-factor productivity. In other words, the dispersion of both wages and productivity has been faster at the bottom than at the top. In the upper tail, there is even evidence of a small element of convergence in the early 2000s, which then disappears in the second half of the decade when there is also divergence at the top. Note: Panel A (resp. B) plots the estimated year dummies of a regression of log-wage (resp. 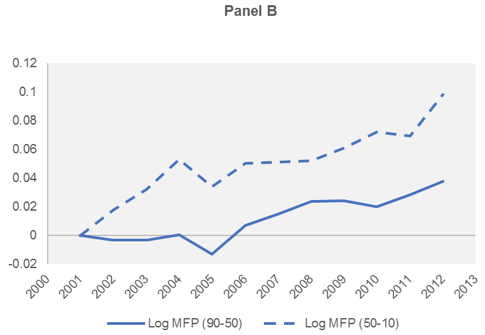 log-MFP) dispersion at the top – 90th to 50th percentiles ratio, solid line – and at the bottom – 50th to 10th percentiles ratio, dashed line – within country-sector pairs, using data from the following countries: AUS, AUT, BEL, CHL, DNK, FIN, FRA, HUN, ITA, JPN, NLD, NOR, NZL, SWE. These parallel trends in dispersion both at the bottom and the top further suggest that the distribution of wages and productivity are linked. To assess this, we econometrically estimate the correlation between the 90-10 wage ratio and the 90-10 productivity ratio. We find that within country-sector pairs, there is positive correlation between an increase in productivity dispersion and an increase in wages, even accounting for the workforce or firm-age composition of the sector. An increase of one standard deviation in the dispersion of logged labour productivity (respectively, MFP) correlates with an increase of logged wage dispersion by 25.5% (respectively, 19.5%). In well-functioning markets, we expect wages to reflect labour productivity, so that dispersion in wages could be linked to dispersion in productivity. The literature has suggested that this could be further strengthened by the fact that the most productive workers increasingly work for the most productive firms. For example, there is evidence of a clustering of high-skilled workers in high-paying firms (Bagger et al. 2013), as well as increased use of outsourcing of non-core low-value added low-pay activities (Goldschmidt and Schmieder 2015). Rent sharing – that is, workers in high profit/high productivity firms enjoying a share of the firms’ rents – also plays a role in explaining this trend (Card et al. 2014, Card et al. 2013). To understand what affects wage inequality and its link with productivity divergence, our work investigates the role of structural factors as well as policies and institutional features of the economy that might have strengthened or weakened the correlation between wage and productivity dispersion. First, we find that globalisation and digitalisation are not only associated with an increase in between-firm wage inequality, but they also strengthen the link between wages and productivity dispersion. In sectors where firms increase the use of information and communications technologies (ICT) over time, wage dispersion grows faster, which suggests that ICT affects firms heterogeneously. We also look at sectors that become more open to trade through either imports or exports. In those sectors, not only has wage dispersion increased but its link with productivity dispersion has also been strengthened. Our results contribute to the literature showing that globalisation may also have an indirect effect on between-firm wage inequality (Helpman et al. 2017). Country-specific policies and institutions also play a role in shaping the evolution of wage and productivity dispersions, and the link between them. A significant amount of evidence has been gathered on the role of policy and institutions for explaining the observed increase in wage dispersion, in particular the decline in real minimum wage and, for the UK and the US, the decline in unionisation. For continental European economies, the focus has been on the degree of centralisation of wage bargaining, and where greater decentralisation is typically associated with higher wage dispersion. The results of our analysis suggest that all of these policies have the intended consequence of reducing wage dispersion and, hence, overall inequality. At the same time, they affect the link between wage and productivity dispersion. For example, more centralised bargaining is associated with a weaker link between productivity and wage dispersion, while this is not the case for changes in employment protection legislation and union density, the effects of which are significant only in the cross-section but not over time. More centralised bargaining can therefore help to limit wage dispersion, but at the same time it weakens the link between wages and productivity dispersion, which might be detrimental to long-run growth. Conversely minimum wage policies, while also reducing wage dispersion, are associated with a stronger link between wage and productivity dispersion over time, which could benefit long-run growth. Using firm-level data, we show that wage dispersion and productivity dispersion have both increased within sectors, and that these two increases are linked. This is particularly evident in sectors that are more open to trade and are more ICT-intensive. As would be expected, wage-setting institutions affect the distribution of wages, but our work shows that they also have an indirect effect by affecting the link between productivity and wage dispersion. Andrews, D, C Criscuolo, and P Gal (2017), “The Best vs the Rest: The Global Productivity Slowdown Hides an Increasing Performance Gap across Firms”, VoxEU.org, 27 March. Bagger, J, K L Sørensen, and R Vejlin (2013), “Wage Sorting Trends”, Economics Letters 118(1): 63-67. Barth, E, A Bryson, J C Davis, and R Freeman (2014), “It’s Where You Work: Increases in Earnings Dispersion across Establishments and Individuals in the U.S.”, NBER Working Paper No. 20447. Berlingieri, G, P Blanchenay, and C Criscuolo (2017a), “The Great Divergence(s)”, OECD Science, Technology and Industry Policy Papers No. 39. Berlingieri, G, P Blanchenay, S Calligaris, and C Criscuolo (2017b), “The MultiProd Project: a Comprehensive Overview”, OECD Science, Technology and Industry Working Papers No. 2017/04. Card, D, F Devicienti, and A Maida (2014), “Rent-Sharing, Holdup, and Wages: Evidence from Matched Panel Data”, Review of Economic Studies 81(1): 84-111. Card, D, J Heining, and P Kline (2013), “Workplace Heterogeneity and the Rise of West German Wage Inequality”, Quarterly Journal of Economics 128(3): 967-1015. Furman, J (2016), “Forms and Sources of Inequality in the United States”, VoxEU.org, 17 March. Goldschmidt, D, and J F Schmieder (2015), “The Rise of Domestic Outsourcing and the Evolution of the German Wage Structure”, NBER Working Paper No. 21366. Helpman, E, O Itskhoki, M A Muendler, and S Redding (2017), “Trade and Inequality: From Theory to Estimation”, Review of Economic Studies 84(1): 357-405. Mortensen, D (2003), Wage Dispersion: Why are Similar Workers Paid Differently?, Zeuthen lecture book series, MIT Press, Cambridge, Massachusetts. OECD (2016), The Productivity-Inclusiveness Nexus, OECD Publishing, Paris. Piketty, T (2014), Capital in the 21st Century, Harvard University Press, Cambridge, Massachusetts. Piketty, T, and E Saez (2003), “Income Inequality in the United States, 1913-1998”, Quarterly Journal of Economics 118(1): 1-41. Piketty, T, E Saez, and G Zucman (2017), “Economic Growth in the US: A Tale of Two Countries”, VoxEU.org, 29 March. Song, J, D J Price, F Guvenen, N Bloom, and T von Wachter (2015), “Firming Up Inequality”, NBER Working Paper No. 21199.